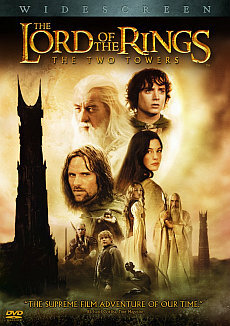 Disc 1 contains 23 differences altogether. The SEE (Disc 1) is 0:24:54 Minutes longer (PAL running time). 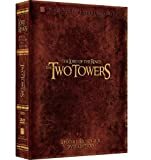 If there are some smaller recuts, the scenes are described in a wider context, and common scenes are mentioned. 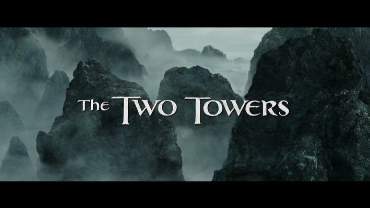 SEE: The title “The Two Towers” appears in a different scene than in the theatrical version. 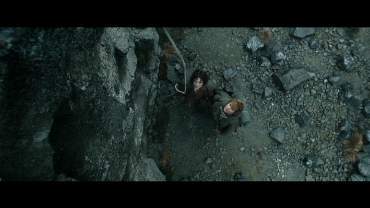 Frodo and Sam are climbing down a rock. 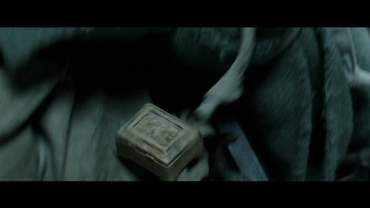 Accidentally, Sam drops a small box. 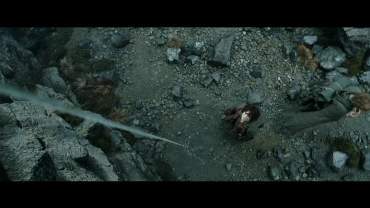 As Frodo tries to catch it, he falls down – however, he is unharmed. 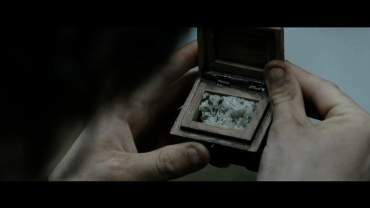 As he asks Sam about the box, Sam says it’s something special: the best salt in the Shire. 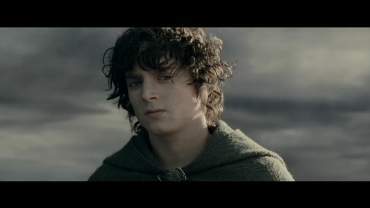 Frodo says it’s a bit of home, indeed something special. 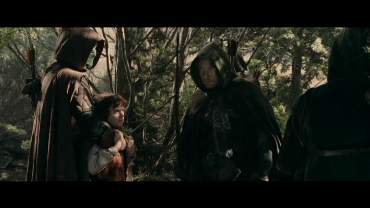 The hobbits discuss if they should leave the rope in case someone should follow them. 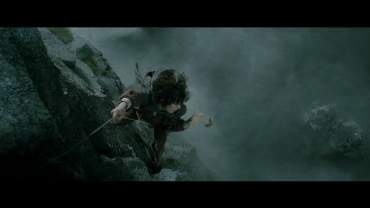 However, as Sam pulls the magic elvish rope, it comes down on its own. 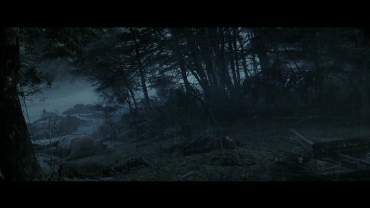 This scene is almost like in the book. 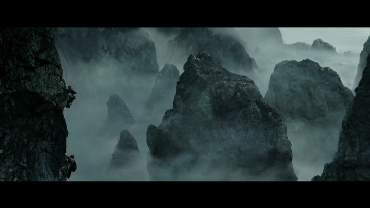 The Theatrical version contains instead a shot of the hobbits wandering over a rocky area. 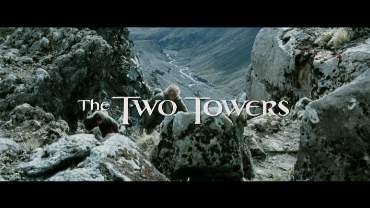 There, the title “The Two Towers” appears. The SEE also contains the end of this shot. 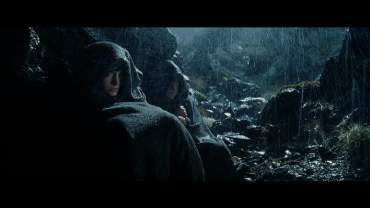 (Sam says: “Those rain clouds might”) The hobbits rest under a rock under the pouring rain. 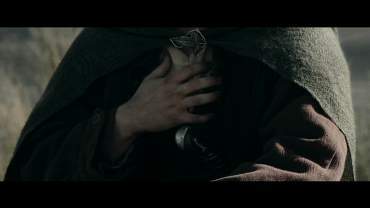 They are shown from above, and suddenly a clutching hand is revealed and a coughing breath is heard. 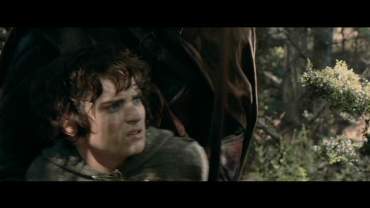 Frodo looks anxiously around, but he cannot see anything. 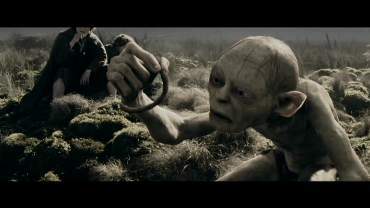 SEE: Gollum is running away, arguing with himself. 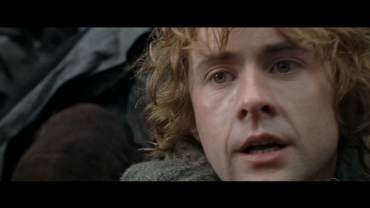 On the one hand, he does not want to go to Morder; on the other hand, he promised Frodo to bring him there. 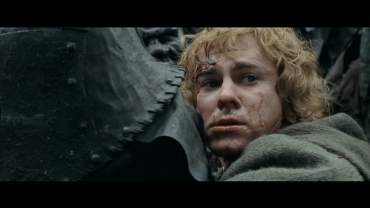 As he runs away, Sam says that he betrayed them. 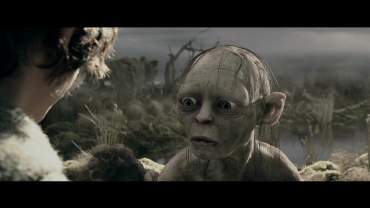 Suddenly Gollum reappears and calls the hobbits to follow him. 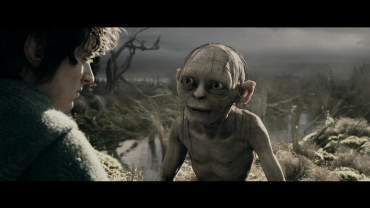 In this scene, the split personality of Gollum is introduced for the first time. 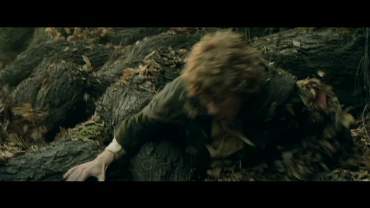 Theatrical version: Gollum is shown running away, followed by the hobbits, in an alternative take. 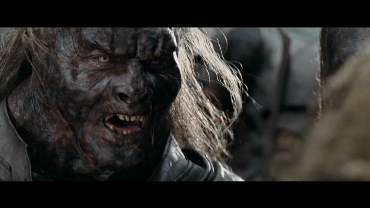 SEE: As Uglúk (the Uruk-Hai leader) stops the orc platoon, a group of Mordor orcs joins it, led by Grishnákh. 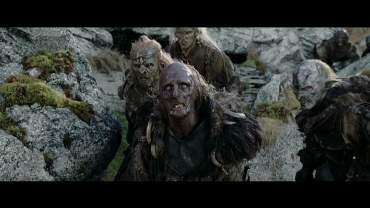 These want to bring the Hobbits to Mordor. 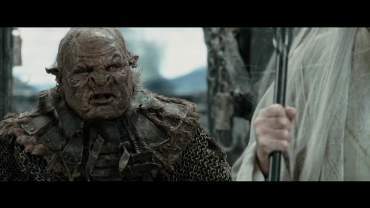 Uglúk refuses and tells that he will deliver the hobbits to Saruman. 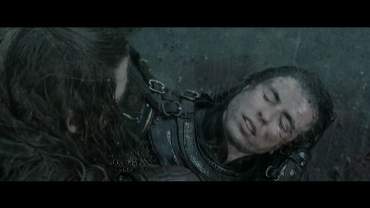 Pippin sees that Merry is unconscious and asks the Uruks to give him water. 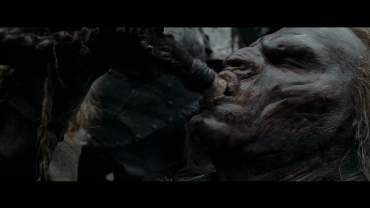 The Uruk-hai laugh at him and give Merry some nasty draught to drink. 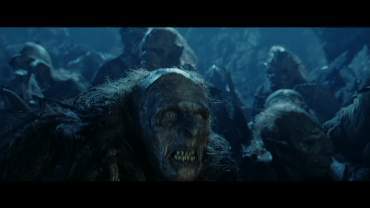 Suddenly an Uruk smells “Man-flesh” and the orcs start running again. 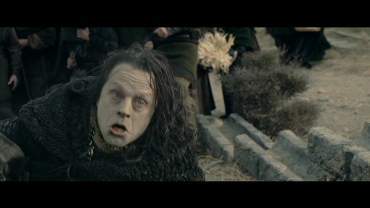 Theatrical cut: the scene is edited differently, as if Uglúk stops the Uruk-hai after smelling “Man-flesh” (an alternative take than in the SEE). 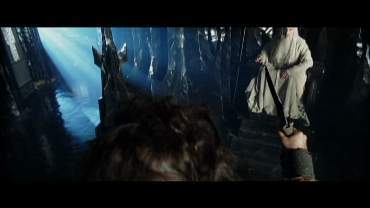 This scene portrays the competition between Saruman and Sauron which played a large role in the book, but was made less prominent in the film. 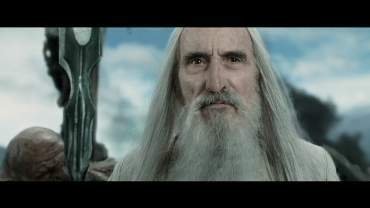 SEE: Saruman is standing over Isengard, talking to an orc. 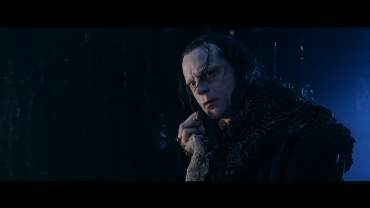 He orders to make a dam on the river and to heat the ovens in order to armor his host as soon as possible. 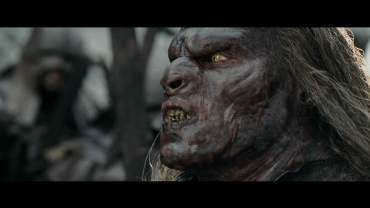 The orc complains that there is not enough fuel. 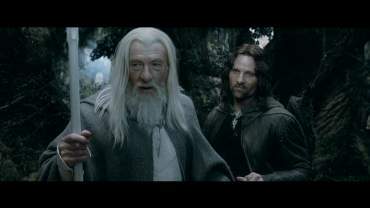 Saruman points to the Fangorn forest lying just in front of them and orders to cut it down. 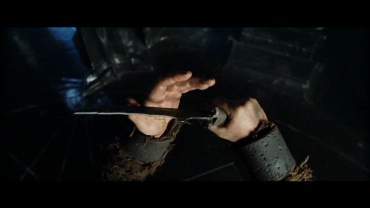 In the next scene, the leader of the Dunland people pledges loyalty to Saruman by cutting his hand. 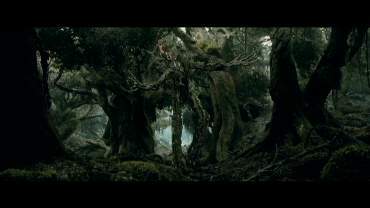 This extended scene sets up the later revenge of Treebeard for Saruman cutting his forest down. 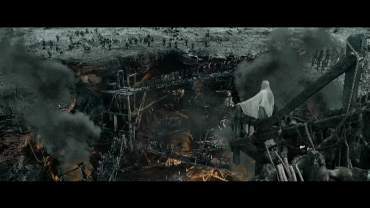 Theatrical version: Saruman is shown inspecting his army. His voice off-camera says that he needs to remove those who oppose him (in SEE, it appears later). 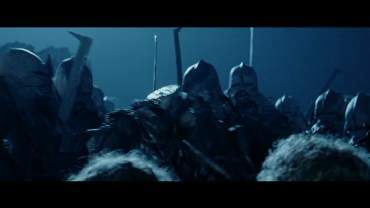 Saruman goes through the crowd longer. 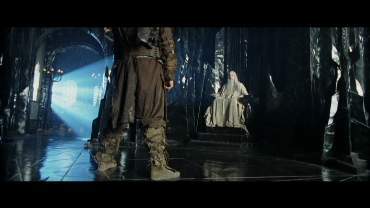 Off-camera, his voice is heard: “We have only to remove those who oppose us.” (In Theatrical cut, it was in Cut 5). 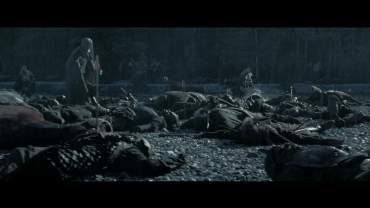 At the fords of the Isen river, we see dead bodies after a skirmish. A host of riders comes along. 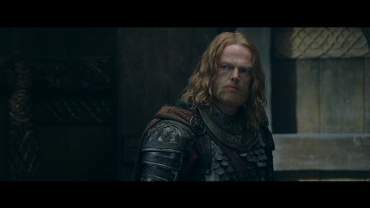 The captain, Éomer, looks for Théodred, the son of the king, among the dead. 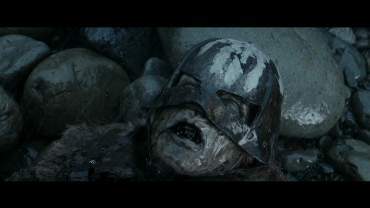 A soldier says that Mordor shall pay for this. 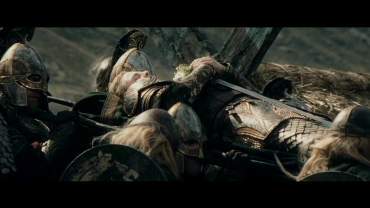 Éomer replies that these orcs are not from Mordor and shows a dead Uruk-hai, whose helmet bears an insignia of Saruman’s white hand. 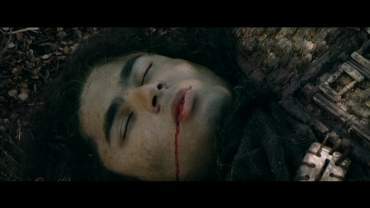 The soldiers find Théodred who is wounded, and ride back to Edoras. 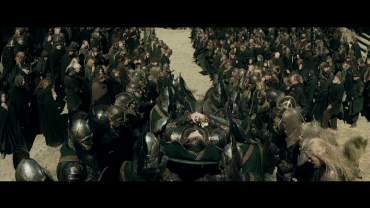 In the theatrical versions, one long camera shot shows the riders riding to Edoras, in the SEE there are several shorter takes. 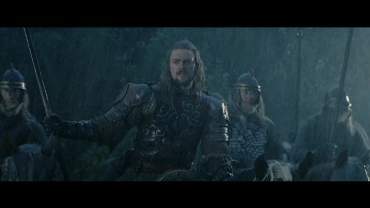 In the Theatrical version Éomer does less struggling. 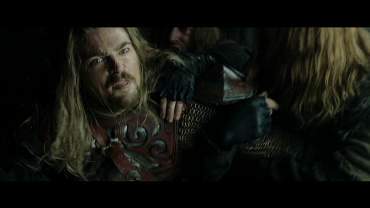 Éomer defends himself and says that Gríma has no authority to banish him. 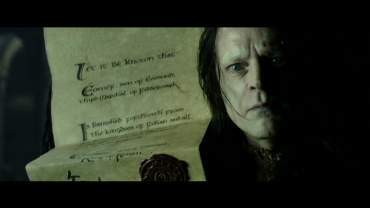 Gríma answers that this is an order by the King, signed this morning – and shows him the signed order. 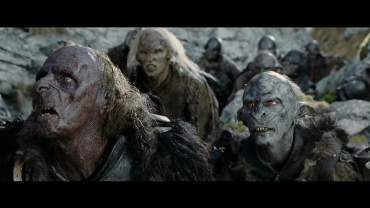 (After Grishnákh says “...They look tasty”) Uglúk tells him that the prisoners are to be delivered to Saruman alive and unspoilt. 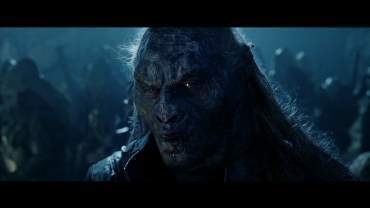 Grishnákh wants to know if they give good sport, and Uglúk replies that they have something important, an Elvish weapon that his master wants for the war. 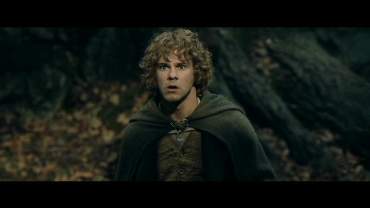 Merry and Pippin realize that the orcs think, they have the Ring. 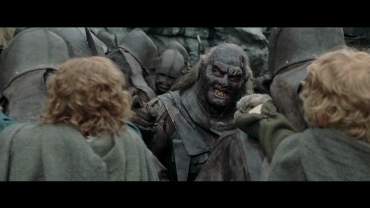 Meanwhile another orc is sneaking behind them. 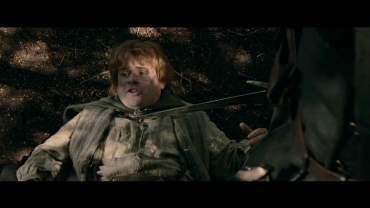 As he attempts to strike at them, the theatrical version goes on. 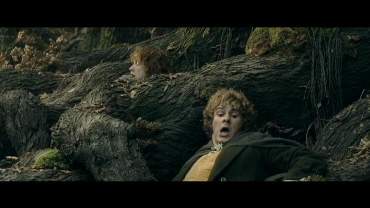 Merry and Pippin turn around and see the headless body of the orc falling down. 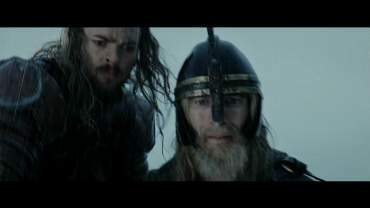 They look at Uglúk, terrified. 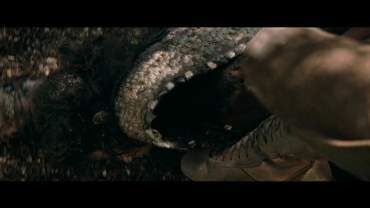 A new scene with Gollum in the swamp. 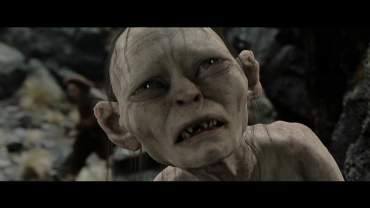 Gollum is complaining as he is hungry. He catches a big worm and swallows it. 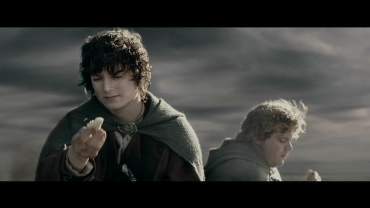 Frodo offers him a bit of his lembas bread, but Gollum won’t eat Elvish food. 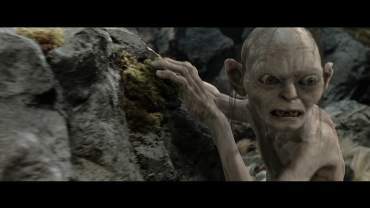 As Sam rebukes him, Gollum sneaks up to Frodo and says: “Master knows. Yes. Precious. 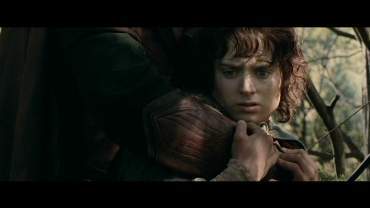 Once it takes hold of us… it never lets go.” He tries to touch the Ring, but Frodo pushes him away. Legolas tells Gimli that the Ents taught the trees to speak. Gimly wonders what trees have to talk about, except for the consistency of squirrel droppings. 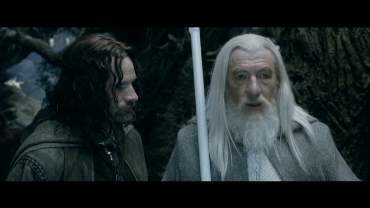 SEE: Legolas excuses himself for confusing Gandalf with Saruman. He’s kneeling down as he speaks. 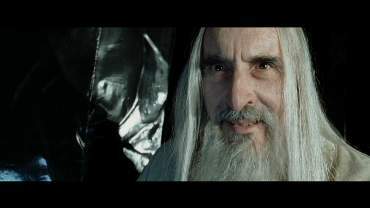 Gandalf says that he in fact is Saruman – as Saruman should have been. 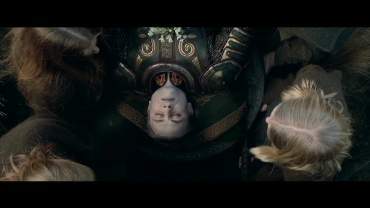 Theatrical version: Legolas is kneeling down, but does not say anything. 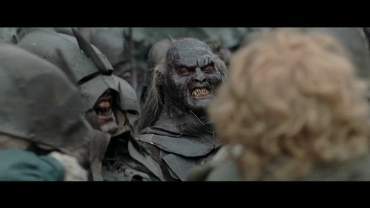 Gandalf smiles at the Three Hunters. 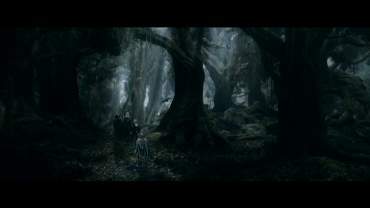 Gandalf, Gimli, Legolas and Aragorn walk through the forest longer. 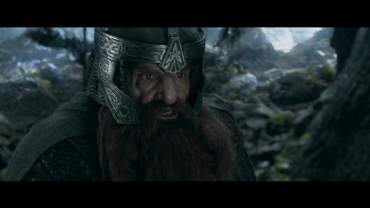 Gimli is unsure if they should leave the hobbits in this horrid forest – as he offends the forest even more, it starts to rumble. 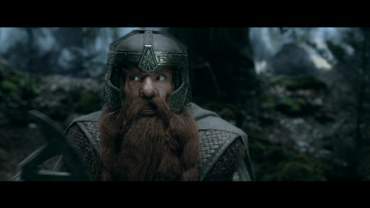 Gimli corrects himself and calls it a “charming” forest. 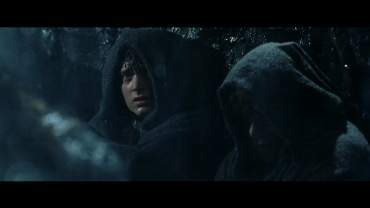 Gandalf says that Merry and Pippin are safer here than Gimli is about to be. 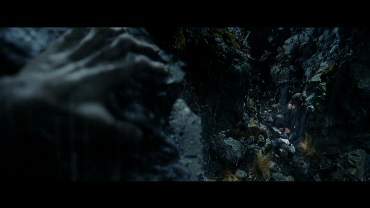 He tells that the hobbits are like small stones which cause an avalanche that will wake the Ents who will then discover that they are strong. 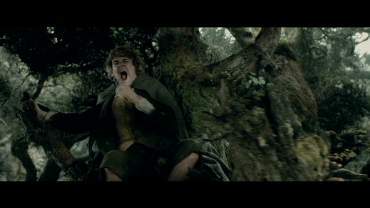 In the SEE and in the Theatrical versions we have two different scenes with Merry, Pippin and Treebeard, which share some common dialogue lines. 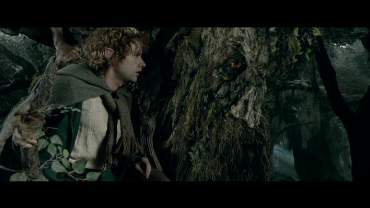 SEE: Treebeard tells a poem to Merry and Pippin. 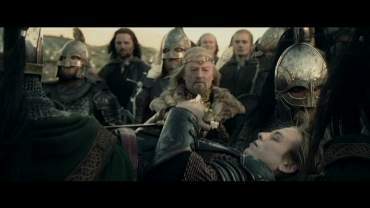 He tells them that he promised to Gandalf that nothing will happen to them. Then he tells them a lullaby poem, one of his own compositions. 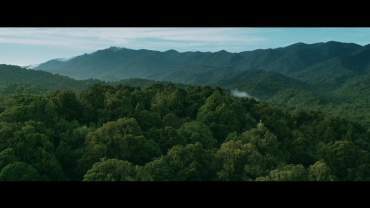 Meanwhile, some beautiful shots of the Fangorn forest are shown from the air. As we see them again, Merry and Pippin are already fast asleep. 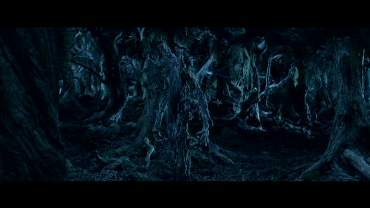 Treebeard puts them tenderly on the ground and wanders off to summon everybody to discuss the upcoming danger. 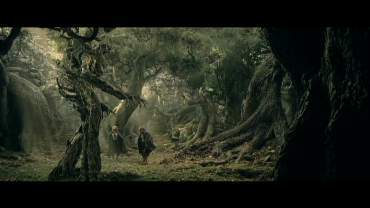 Theatrical version: Treebeard tells that he promised Gandalf that nothing will happen to them (partially with alternative material). 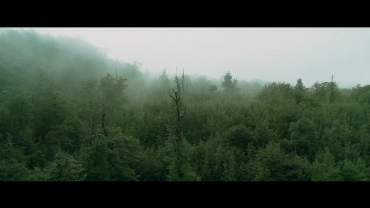 Then he tells them that the trees have grown angry and that there are too few Ents left to handle them. In the SEE this scene will come later. 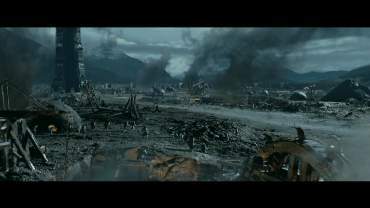 (Scene change) A new scene which appeared in parts in the preview for “The Two Towers” which was appended at the end of “The Fellowship of the Ring” film rolls after the Oscar ceremony. A night’s rest of Aragorn, Gandalf, Gimli and Legolas. 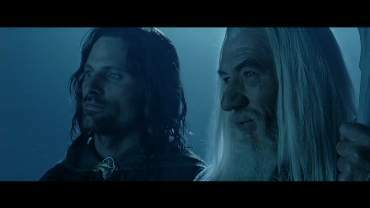 Gandalf talks to Aragorn and tells him the situation: Sauron, the Dark Lord, is afraid of Aragorn, an heir of Númenor. 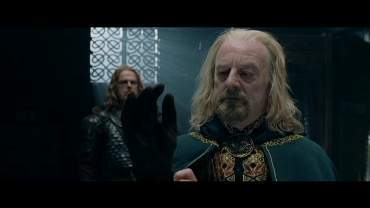 He tells him that King Théoden’s spirit is poisoned and that the villains Saurond and Saruman are tightening the noose. 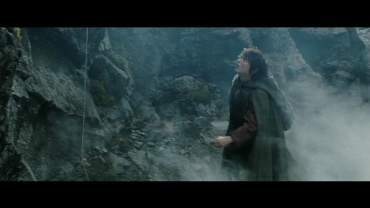 But they do not know that the Ring is on its way to Mordor and that Frodo is to destroy it alone. 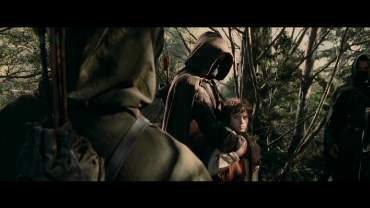 Aragorn says that Frodo is not alone – Sam is with him. 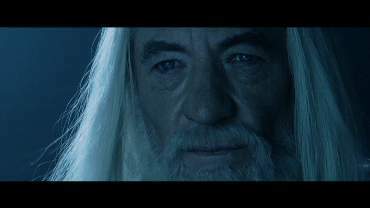 Gandalf is surprised; he smiles and says that this is very good. 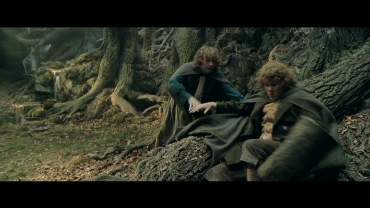 Another long scene with Merry, Pippin and Treebeard in the SEE. 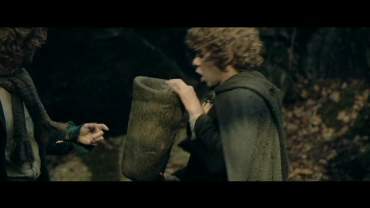 Merry wakes up and sees Pippin drinking from a well. As they make conversation, some strange noises can be heard. 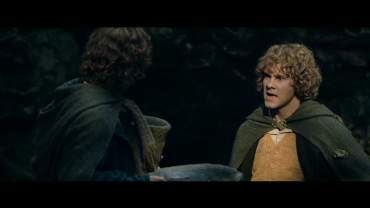 Merry finds out that it is in fact Pippin, who makes them. 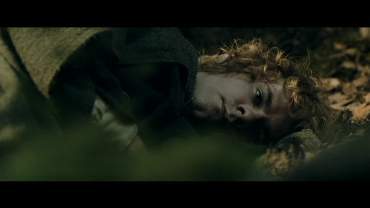 He also sees that Pippin has grown after drinking the water from the well. Merry snatches the mug and drinks the water, too. 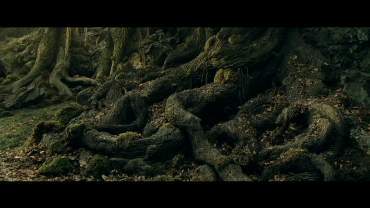 Suddenly the two hobbits are snatched by the roots of an old tree which drags them under the ground. 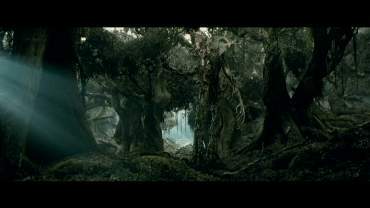 Then, suddenly, Treebeard appears and sets them free. 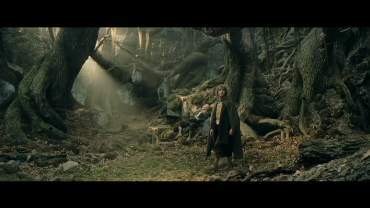 This tree root scene is a homage to a scene from the book, where Tom Bombadil, who was cut out from the first film, liberates the hobbits from Old Man Willow. 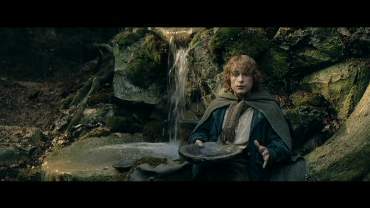 Also from the book comes the scene where the hobbits drink water from the Ent’s well and thus grow taller. 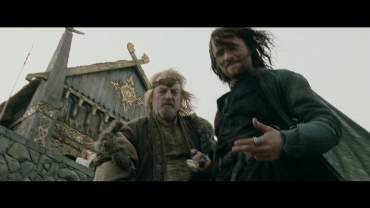 Then we have the scene which took place earlier in the Theatrical version (Cut 16). 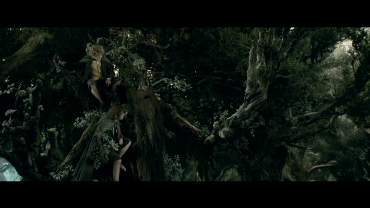 Treebeard carries Merry and Pippin on the shoulders and tells them that the trees have grown angry and that there are too few Ents left to handle them. 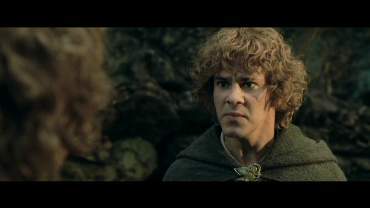 However, the scene goes on: Merry and Pippin ask why there are no Ent-children. 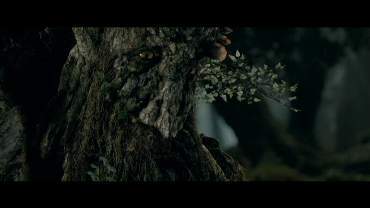 Treebeard gets sad and tells that the Ents have lost their Entwives. 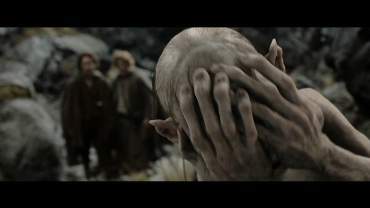 He asks if the hobbits probably have seen them. 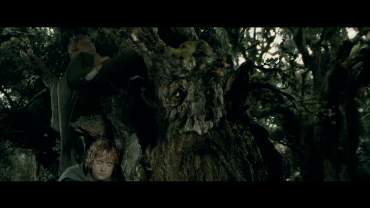 As the hobbits want to know what they look like, Treebeard can’t remember. 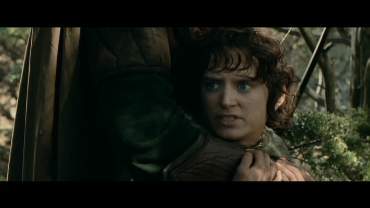 Aragorn tries to help Gríma stand up. 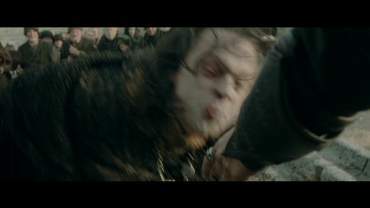 Gríma spits at his hand. 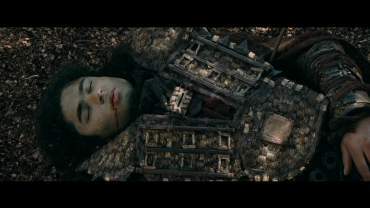 Théodred’s funeral. The King’s guards carry the corps to the crypt. 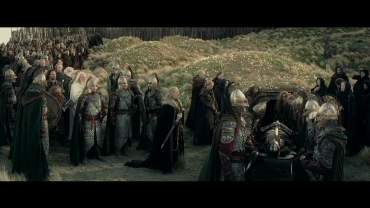 The King, Aragorn, Legolas, Gimli and Gandalf follow the procession. 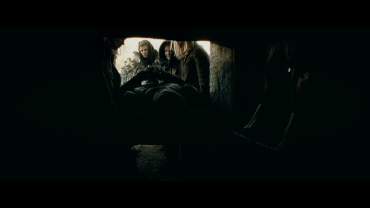 As the corpse is lowered into the crypt, Éowyn starts to sing a funeral song in Old English. After the body is lowered, the closed crypt is seen half a second longer, and we hear the sound of a closing stone plate. 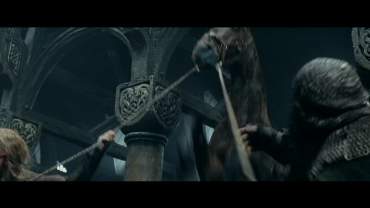 After Gandalf rode away, there is a new scene in the stall. The servants try to lead out a mad stallion. 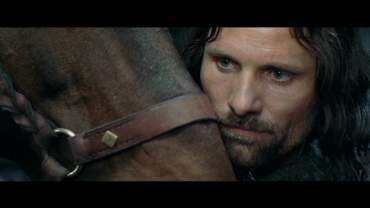 Aragorn talks to it in Elven tongue, and the horse calms down. 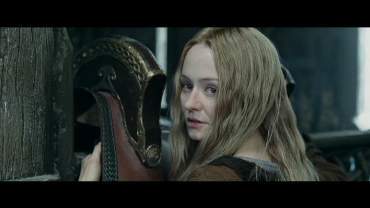 Éowyn is watching him. 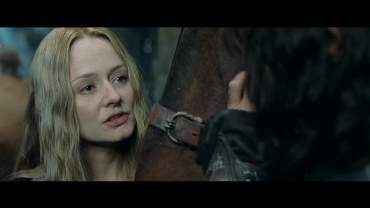 She starts conversation and tells Aragorn that the horse’s name is Brego, and that it belonged to her dead cousin. 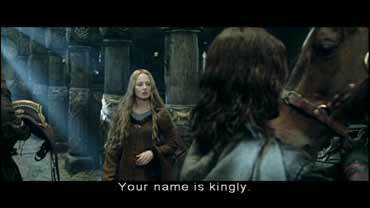 Aragorn says that this is a kingly name. 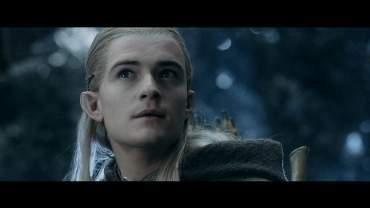 He tells Éowyn that he lived in Rivendell as a child, and thus speaks Elvish. 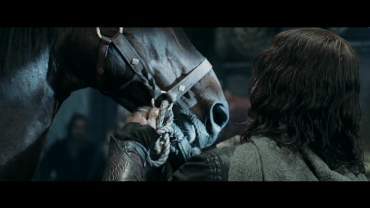 He asks to set the horse free, as it has seen enough of the war. 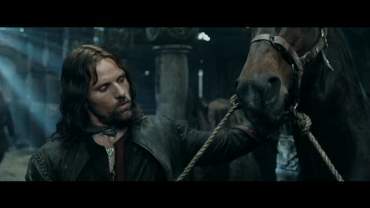 It’s an important scene, as this is this very horse which will rescue Aragorn from the river later. 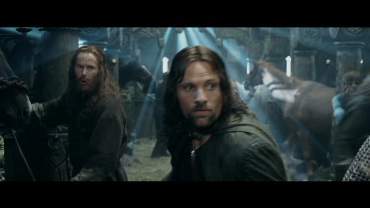 Also, we get to know a bit more about Aragorn’s background in Rivendell. 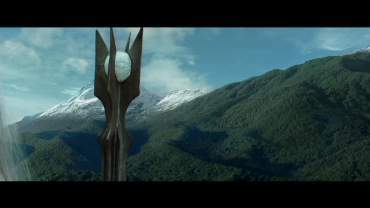 Gríma has arrived in Isengard. 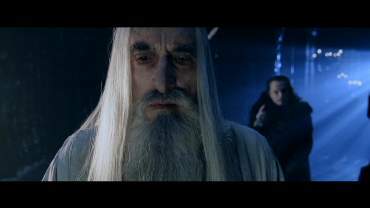 Saruman is displeased and tells him that he smells of horse. 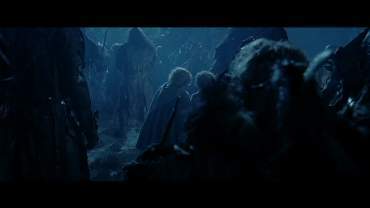 Gríma tells him about Gandalf’s companions. 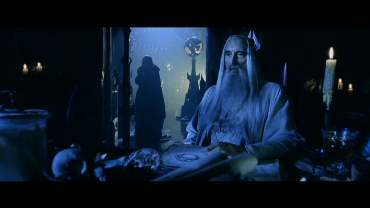 Saruman is particularly interested in the man. 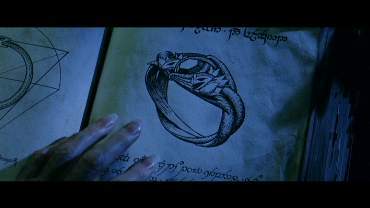 Gríma says it’s one of the Dúnedain from the North, but he wears a strange ring which he describes. 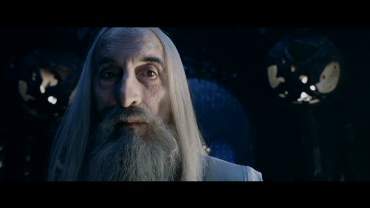 Saruman looks up in a book, it is the Ring of Barahir. 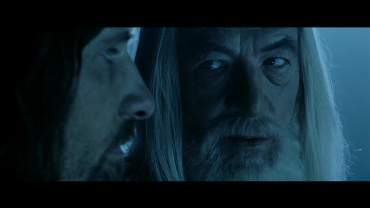 He says: “So Gandalf Greyhame thinks he has found lsildur's heir. 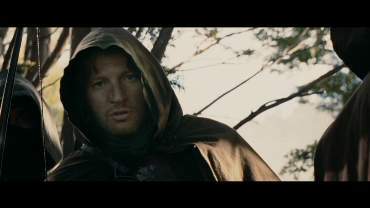 The lost king of Gondor. He is a fool. The line was broken years ago.” This line has also appeared in the Theatrical Preview. 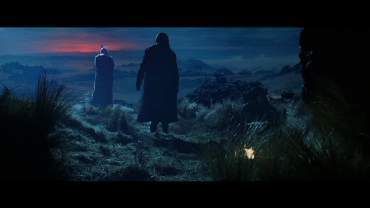 Fugitives walk from Edoras (one of the shots appears at a different time in the Theatrical version). 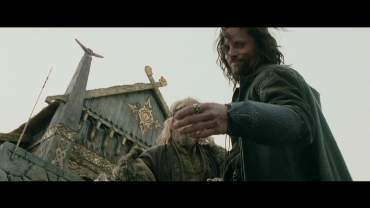 King Théoden asks his servant Gamling to get his horse. 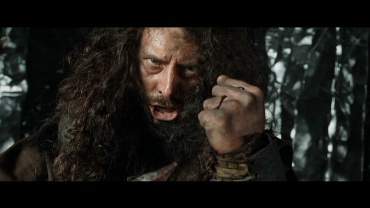 He says that it is not a defeat, for they will return. SEE: direct cut to the shot of the King at the avant-garde of the host. 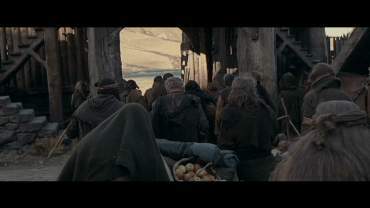 Theatrical Version starts with the shot of the fugitives walking out of the gate of Edoras (in SEE, it’s earlier, in Cut 20). 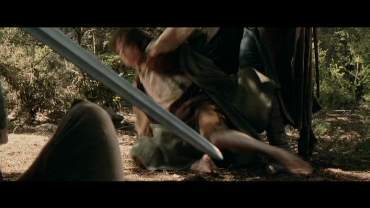 In the SEE we see a longer scene where Frodo and Sam are taken captive by Faramir. “You wonder what his name is… where he came from. And if he was really evil at heart. What lies or threats led him on this long march from home. If he would not rather have stayed there… in peace.“ Then he says that war makes corpses of us all and commands: “Bind their hands”. 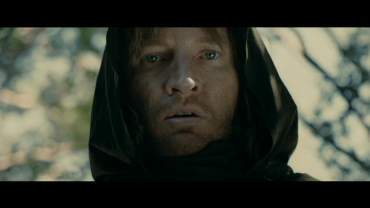 Theatrical version: Faramir enters (different take), looks at Frodo and Sam and orders: “Bind their hands”.